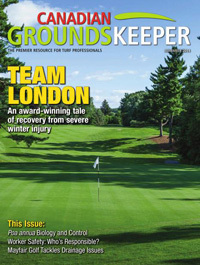 Canadian Groundskeeper is a bi-monthly 'e-zine' edited exclusively for Canadian turf managers. Our editorial focuses on the issues that matter most to turf professionals. Whether it be pest and disease pressures, or the latest products, services and/or environmentally responsible turf management practices, Canadian Groundskeeper is there to share advice from renowned experts and respected peers. Our readership includes select golf course superintendents, sports turf managers, parks & recreation managers, lawn care companies, landscapers, educators, and others allied to the turf industry. Canadian Groundskeeper is the only publication to take full advantage of today's digital publishing opportunities, meaning busy turf managers, who must balance administrative duties with that of hands-on turf care, can read the publication anywhere they might be. This is our way of ensuring the information they need to do their job is received when or where it is needed most.